On a recent outing I decided to fish a variety of dry flies that have proven themselves as pretty good brook trout flies. The three I had chosen were tied in areas where the eastern brook trout is native and in some very impressive mountain regions. The day chosen turned out to be just what you would want when fishing these flies..cloudy with a break or two of sun. There was no wind to deal with so good drifts were not a problem. I'm not going to tell you the names of the flies I used, instead I'll let you guess what they are. Fresh new life..more each day. The first fly I used. This was a super fly. 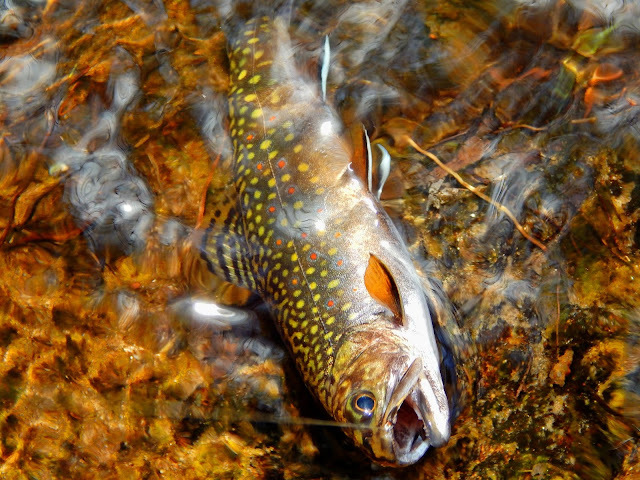 The brook trout were found in many places this day, plunges, riffles and tail-outs. This brookie was taken on the second mountain fly. He was in great condition and strong. At the tail of this pool is where the third mountain fly found it's mark. Lovely, a tribute to the stream. Great fly...there are a few issues when tying it, but well worth it. Monday I fished a new stream, it's been there perhaps forever, none the less new to me. I had seen the stream many years ago but not until Monday did I venture off and fish it. If lows in typical fashion with some impressive pools, which were quite large and it also contained some very slippery rocks. In my last post I wrote about a fly called a "Smoke Fly", and this was the day I would test it. The day featured sun and clouds, a normal Spring day. This was not the first pool I came to but it was the first I fished. The fly was cast to the bank and drifted a few feet, the fish came from the undercut and took the fly...new fly, first cast and the first fish of the day. The fly kept on producing and at one point in the pool pictured above I took 5 brookies on 5 consecutive casts. The stream is healthy. The stream looks to be on private land, for I noticed an electric fence. There were no posted signs, but I'll have to do some further research. This little guy had some pronounced orange spots, man he's pretty. She's lovely also, several were observed. More "North Country Flies"...where there's smoke theres fire. In Robert Smith's book The North Country Fly I came upon this old pattern. I believe it dates back to 1890 and has several different dressings. The photo in the book is the one I tied and is pictured here. I can pretty much guarantee you won't be able to find this fly in your local fly shop or online. It really is a simple pattern, peacock herl and a hen feather, and I can tell you it is "very" effective, to the tune of a trout on the first cast and at one point 5 brook tout out of one pool. I will post that report in my next post. The name of the fly is the "Smoke Fly"
Another North Country Fly is the "Throstle Wing"...now the availability of some of these feathers are difficult to come by, so one must try to substitute. I have not tested this pattern as of yet, but soon. This North Country pattern is know as "Poult Bloa"...this is another old English pattern. This fly worked very well for me. Earth Day dawned with a mix of rain and fog, with a very raw breeze that seemed to find every bit of my covered bones. Kirk and I agreed to meet and do some fishing on a stream know by some as the "family secret". A beautiful area of Connecticut highlighted by rolling hills, old stone walls, a quaint general store that has some of the best brewed coffee that I have ever tasted. Not to be left out is the stream itself. Kirk and I both agree that this is one of the states best wild brook trout streams. We say this in the meaning of location, quietness, beauty, and such a mellow sound of the water as it rumbles to meet the sea. Spring awakes...there were so many wild flowers of every size and color, their beauty enhanced by the gentle rain. The fishing was enjoyable, the catching was slow at least for me...but no complaints. I came upon a run that has been good to me in the past. I cast the fly and it soon found a willing participant. The fish was on and soon it was off. Several casts later the same event "on then off". They say the third time is the charm and that was the case. To say that a brook trout knows his stream is an understatement, they know every stone, branch, and deep hole in it. A few moments of battle and this incredible dark wild jewel was at my feet. I took out the camera to photograph it and the rain drops were all over the lens. I dry it and to my surprise the fish stayed posed for me. The fly removed and off it went. Earth Day 2017, in the Connecticut woods. This is probably the smallest stream I've ever fished for brook trout. When I gazed into it yesterday I could not believe what I saw. Man it was full of mini-brookies, they were scattering every where. I dropped a fly in that stream in various places and I had a awesome response. I'll finish telling you about it in a future post. Last week I had a spectacular day of fishing, and what made it so special aside from where I fished and the trout I caught was the fact that I only fished one fly. That fly was a "Golden Badger" emerger. It's a fly with few materials and pretty easy to tie.....Recipe is..Tail, lemon wood duck...Body, brown thread lightly dubbed with ginger squirrel, and golden badger hackle. The Golden Badger is similar to the "Lackie Special" it to is an emerger and has been a very good producer of late. Peaceful Places, pretty much sums it up. The latest newsletter from "The Franklin Land Trust" has a great article on the on going restoration-enhancement of there Crowningshield Conserved Property. The west branch of the North River flows through this pristine piece of the northeast. It has wild brook trout and I can tell you that they are worth the effort it takes to be able to fish for them. The FLT is doing great work here, and you can read about it here, or you can contact them at Franklin Land Trust.org take a few minutes and drop them a line or two and tell them what good work they are doing and how much it means to like minded people like us. They will appreciate it. Good morning folks. Before I get into a wonderful trout outing I'd like to tell you about the eggs featured in this photo. My daughter and son in law along with the two grandkids purchased 6 little chicks. Well long story short they are producing eggs like crazy. Jeanette and I have been getting regular deliveries of "fresh" eggs. Man they are awesome. What a way to start your day. Monday was one of a string of beautiful spring days we have been experiencing. It was on the mild side when I parked the Honda. I got into my waders and geared up. The fly you see was the only fly I needed that day. The stream.."perfection", my if only everyday could be like this. "Trout Lilly"..a sign that all is well this spring morning. It did not take long until the first brook trout was at hand. The sunlight and the clear water highlighted it's beauty. Free flowing among the hemlocks. 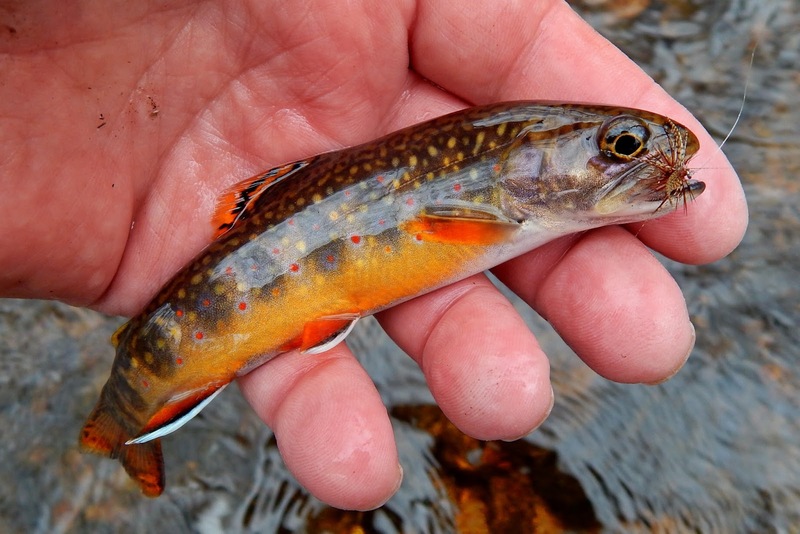 Yet another variation in the coloration of CT's brook trout. This fish was exceptionally green. The photo really does not show it well. His dorsal fin is also green, I have not seen this before. This stream also produced a very light colored brook trout, I wrote about it several weeks ago. Just beyond and to the right of this stone I observed a brook trout lying almost as if not alive. I observed for several minutes and there was no movement except for a slight tail twitch. I cast the fly just behind him and retrieved it slowly. As the fly passed him he moved like lightning to the fly. The last jewel of the day. A day that will be hard to top. Olives, no this is not a post about those salty mainstays of so many worldwide. Instead its about those little mayflies that so many are aware of. These flies are about from late April to September and can bring about some interesting reactions from the resident trout populations. Some of these flies can be tiny, and some not so, those are what I tie...14-16-18, and i tie the spider-soft-hackle version. Materials are, hooks, olive silk, natural mole dubbing, and dun hen hackle. The silk is started behind the eye and wrapped back to about the hook point or slightly beyond. Always touching turns with the silk in order to eliminate gaps. The silk is then touched lightly with wax about an inch and a half. Then the mole is dubbed very sparse. You can now remove some if you think it maybe to much. This is about right for me. Then the thread is wrapped forward to slightly behind the eye. The feather is attached. I know it looks big for the size hook but your only using the smaller barbules of the feather. Two turns of the feather then it's secured with the silk,waste trimmed and whip finished. Completed size 14 BWO spider. Size 14 BWO spider using olive squirrel dubbing, and a somewhat fuller hackle. A size 16 BWO spider, sparse mole dub and sparse hackle.